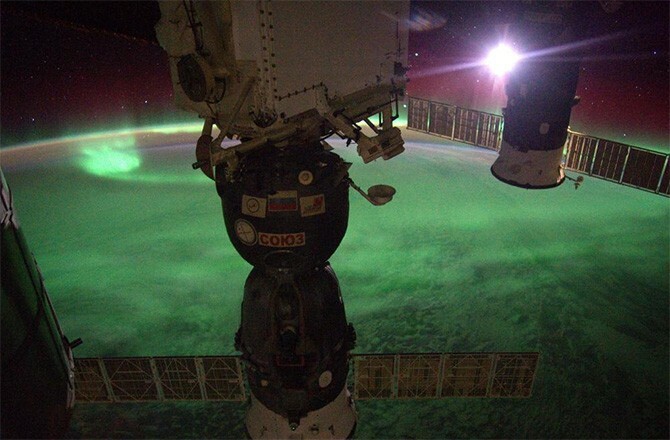 Astronomers have studied a violent young sun-like star, revealing that life on Earth is lucky to have such a strong global magnetic field.
. Two Soyuz spacecraft can be seen in the foreground docked to the space station. In this artist's illustration, the young Sun-like star Kappa Ceti is blotched with large starspots, a sign of its high level of magnetic activity. 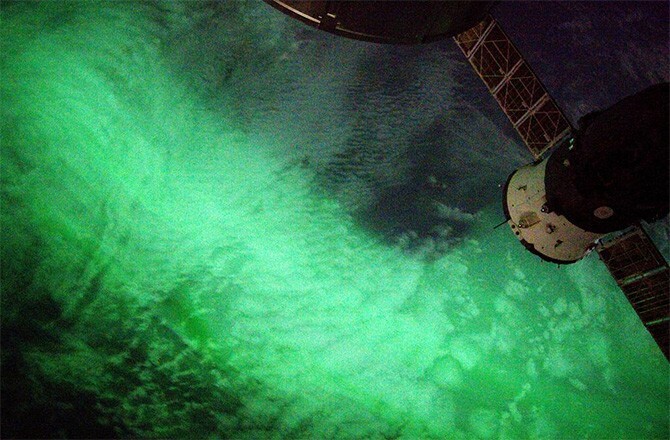 In recent weeks, the crew on board the International Space Station have been treated to some awesome views of space weather in action. The sun, which has been spluttering out some small to mid-sized flares and coronal mass ejections recently, frequently injects charged particles into our planet's magnetosphere. After being channeled toward high latitudes by Earth's magnetic field, this solar plasma impacts our atmosphere, erupting into a stunning auroral display. 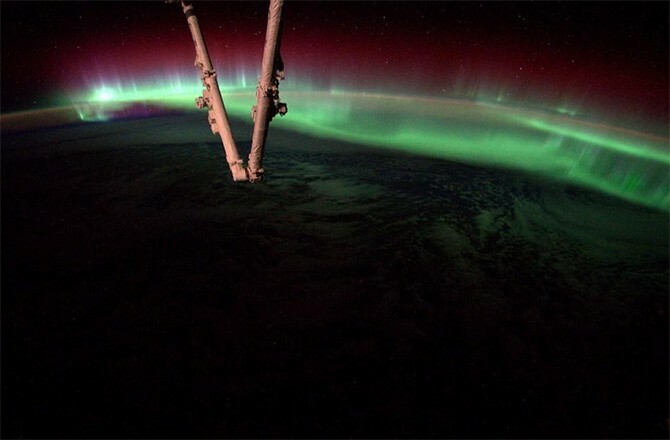 This view from the space station was captured by one of the crew and shows the multicolored streamers of an aurora over the Southern Hemisphere -- known as the Aurora Australis. The different colors correspond to different gases in the atmosphere becoming energized by the solar plasma impacting the atmosphere at high altitudes. 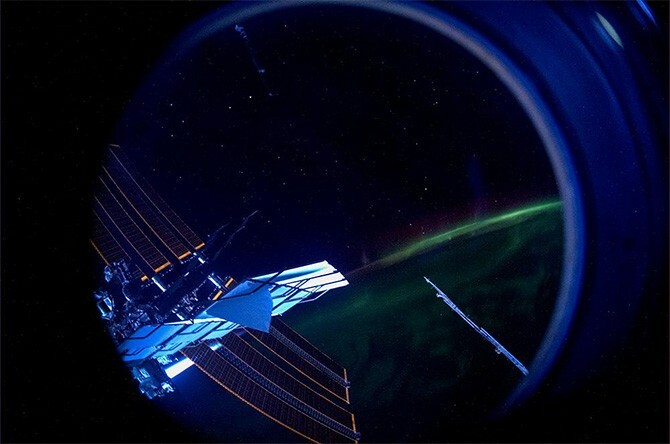 of a diffuse aurora over Earth out of one of the space station's windows. The orbiting outpost's solar panels can be seen to the left. 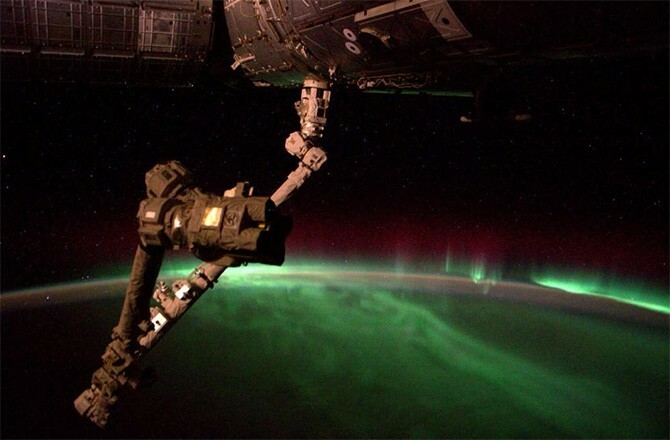 A bright green aurora snakes over the atmosphere below the space station. 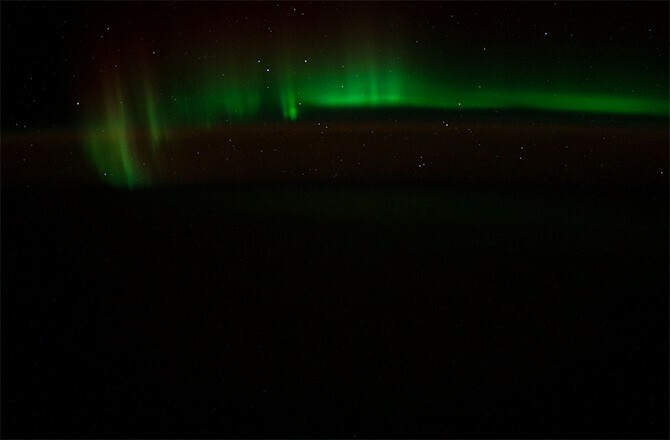 Green aurorae are caused by lower altitude oxygen atoms in our atmosphere being energized by solar wind electrons. : "Never in my wildest dreams did I imagine this." 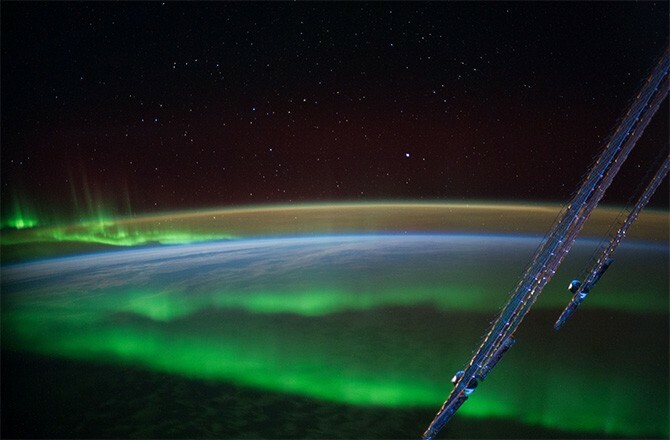 The nighttime hemisphere of the Earth is almost dark apart from the ghostly glow of a green aurora. Often resembling a curtain swaying in the wind, aurorae are strikingly dynamic. They morph into a variety of shapes depending on the quantity of solar plasma hitting the atmosphere and the orientation of the magnetic field. on Aug. 27, a stunning, curved aurora cuts across the limb of the Earth. 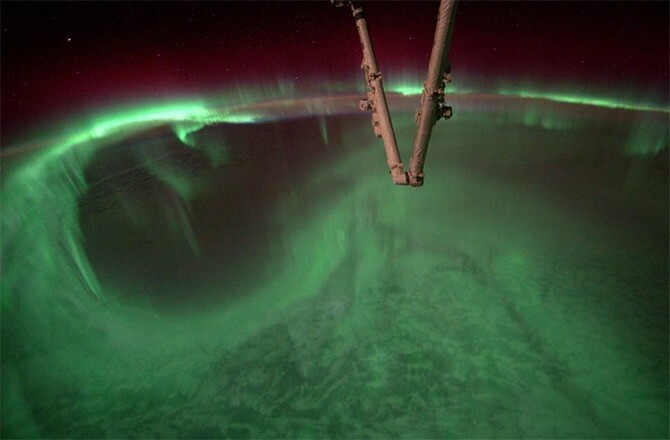 , "This is what we see looking down while being inside an aurora." When our sun was young, it was a very nasty star that erupted with “superflares” and blowtorched the inner solar system with powerful solar winds. Fortunately, the sun finally grew up and mellowed, reaching the calm(er) state it is now. For early life on Earth, our planet’s magnetosphere likely provided much-needed protection against the stellar onslaught, facilitating the evolution of our thriving biosphere. And through the study of a nearby young sun-like star called Kappa Ceti, we now know how lucky we are to have such an effective global magnetic field. Kappa Ceti is located only 30 light-years away in the constellation Cetus and astronomers estimate that it is 400-600 million years old. This star may be sun-like, but it has a lot of growing up to do. At this early stage in its life cycle it is a tumultuous mess, erupting with powerful magnetic activity. Like a teenager going through adolescence, its uppermost layers are erupting with huge clusters of starspots, revealing the violent energy that is torturing its stellar interior. The result is a star that is very, very angry, exploding with flares that release 10-100 million times more energy than the most powerful solar flare ever observed on our sun. In addition, Kappa Ceti’s stellar winds are 50 times more powerful than our sun’s solar wind, ripping through nearby space like a relentless plasma hurricane. We are in effect looking back in time at a star that would have resembled our sun billions of years ago. But to look at this star from afar, it would seem like an impossibility that any biology would survive on a hypothetical planet in orbit. And yet Earth’s biosphere braved the storm of our sun’s youth, a hint that it’s not good enough to have a planet orbiting a star within a star’s habitable zone; that planet needs its own magnetic shield. “To be habitable, a planet needs warmth, water, and it needs to be sheltered from a young, violent sun,” said Jose-Dias Do Nascimento of the Harvard-Smithsonian Center for Astrophysics (CfA) and University of Rio G. do Norte (UFRN), Brazil, and lead author of a study to be published in The Astrophysical Journal Letters. 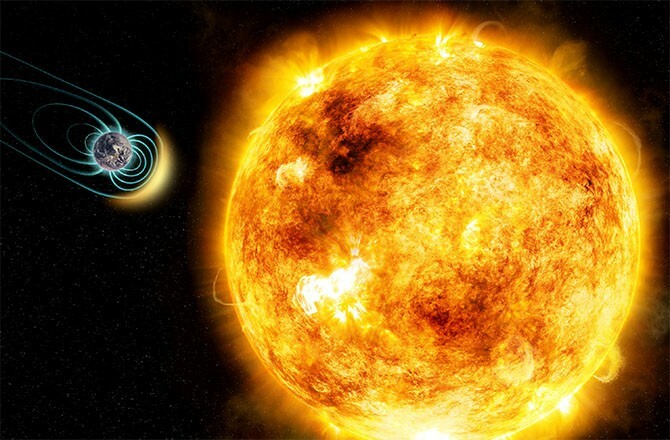 Though it’s taken billions of years for the Earth’s magnetosphere to grow to the strength it is now, some estimates suggest that it was half as strong when the sun was at its most ferocious. But it was, apparently, enough. Around 4 billion years ago, basic life appeared on Earth and now we have an intelligent civilization thriving inside a rich and diverse biosphere. Earth’s magnetosphere did its job. The Earth’s magnetosphere acts as an invisible shield, buffering the sun’s constant stream of energetic solar plasma. 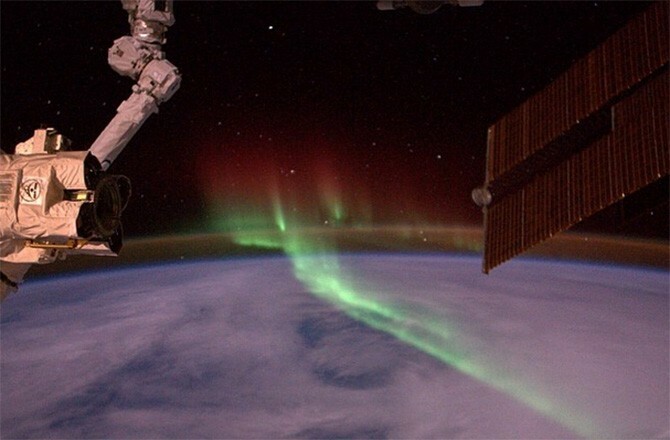 Solar storms do occur and often result in stunning auroral displays as these high-energy particles are magnetically diverted and rain down through the atmosphere at high latitudes. For the most part, life is safe from this ionizing radiation and the magnetosphere also prevents our dense atmosphere from being eroded away by the solar wind. Alas, there is one example in the solar system that is the “poster child” of solar abuse. Mars either lost its global magnetic field early in its history or it never really held onto a sufficiently strong magnetosphere. It succumbed to the constant erosion of the solar wind and countless solar storms and we now know that its atmosphere is constantly bleeding into space. Its frigid atmosphere is 100th the pressure of Earth’s, so it was never given the chance to nurture complex life forms — as to whether it even supported the most basic microbial life remains to be seen. So the next time you feel the sun’s heat on your skin, remember that it was our Earth’s global magnetic field that allowed life to gain a foothold, ultimately creating sentient life shielded from the worst our young sun could throw at it.